One of the reasons Swagbucks is one of our favorite ways to earn free CVS gift cards is they offer so many different ways to earn -- even "passive" ways. Let the SB points add up while you do something else. Details below. Category #5 Free & Passive Ways to Earn: I often have the videos playing while I work in the kitchen, fold laundry, do paperwork or eat. Swagubcks offer videos to watch on a mobile device...there are several different categories to choose from including: Travel, Home & Garden, Food, News, etc. They offer several different mobile watch apps, but we have not had success with any other than the regular Mobile Watch working. Download Swagbucks app from Google play store. Time: Set it and it plays continually until you reach your limit -- unless there is an interruption. Length of videos vary. I like the travel section -- they seem to be shorter and it is cool to see the various places around the world. Videos are also offered on non-mobile devices and you can do both to earn. Earnings: averages 1 point per 5 videos watched. Maximum of 500 points per day (I don't think that is possible even if it played a full 24 hours). Find "watch" link in left side bar on Swagbucks homepage. Time: varies per video, but you just have to choose a set of videos and get them playing while you do something else. When the set is finished it will offer you other sets to watch. Share your Swagbucks referral link with friends and family who may be interested in earning free gift cards for online activities. If they sign up thru your link and earn you earn, too. Once they sign up under your link share the link to these How to Swagbucks 101 series so they will know how to earn. Earnings: 10% on most activities done by your referrals for life. Find "refer & earn" link on top (right of center) of Swagbucks homepage. Time: no time at all after you send your invitation. The earnings will be posted to your account daily. Passive earnings are great ways to earn free CVS gift cards to pay for some of your CVS out of pocket costs each year! If you haven’t signed up for Swagbucks yet and you sign up thru the links in this post Sarah will earn when you earn. These are her referral links and anyone who signs up under her account she will earn 10% of what they earn (on most activities). 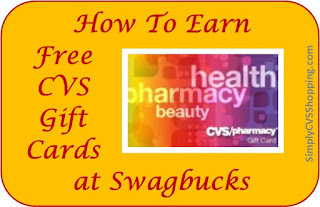 I will share more ways to earn free gift cards thru Swagbucks in later posts. By beginning with these daily free & quick ways you can become familiar with the Swagbucks’ website and see how easy it is for the SB’s to add up.